Members from the Hispanic Bar Association from Orange County, California, USA, along with family members were in San Pedro over the past week for their yearly meeting. 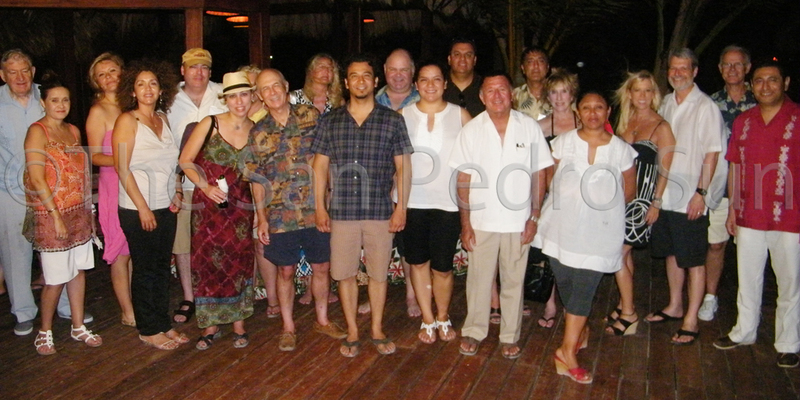 The group of 69 arrived in Belize on Thursday May 26th around noon at Ramon's Village. Shortly after arrival the group of attorneys gathered at the Pineapple Restaurant for the commencement of their seminars. As practicing attorneys, lawyers are required to have a certain amount of hours of lectures in continued legal education. The group took this opportunity to undergo eight hours of lectures and seminars. While in the country the group participated in programs on various laws such as: Family Law, Bias as a Barrier to Justice, Global Warming and Globalization - The Regulation of the Environment. This marked the first four hours of lectures and included a detailed presentation from Oceana's Ms. Audrey Matura-Shepherd, on Offshore Oil Drilling in Belize. 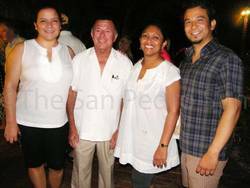 Following the seminars, Ramon's Village hosted a cocktail hour for the group of attorneys and their family members. Present to offer a welcome to Belize and San Pedro was Hon. Manuel Heredia Jr., Minister of Tourism, Civil Aviation and Culture. Genoveva Meza Talbott, President of the Orange County Hispanic Bar Association and Attorney at Law, practicing Family and Marital Law, spoke to The San Pedro Sun. "The purpose of this trip is two fold. One is to provide an opportunity for our membership to get together in a location outside of our regular day to day. We also take the opportunity to make it a location worth exploring, worth getting to know and just exposing our members to a different country. We all share a strong interest of exploring different legal systems, and of course, because we are a Hispanic Bar Association, we have a prevalence to go to Latin or Central America of course". "We had a committee which sent out an inquiry to all our memberships at different locations and Belize was the number one choice. In choosing the location within Belize, we asked people that had travelled to Belize and this is the destination that a fellow bar association from Orange Country had travelled to on multiple times, and had great recommendations." Participants were touched by the wonderful, welcoming service they received upon arriving to the island. With only eight hours from the five day stay being occupied by lectures and seminars, the group had much time to truly experience San Pedro, Belize and all their wonderful natural wonders. The divers in the group were excited to get wet in our warm waters, offering unequalled visibility and the wonder of our Barrier Reef systems and all the marine life that exists within. The group's came to an end with four hours of seminars on Sunday afternoon, followed by a farewell cocktail party at Ramon's Village. In closing Ms. Talbott offered thanks to the Belizean public for being so welcoming and such a good host.